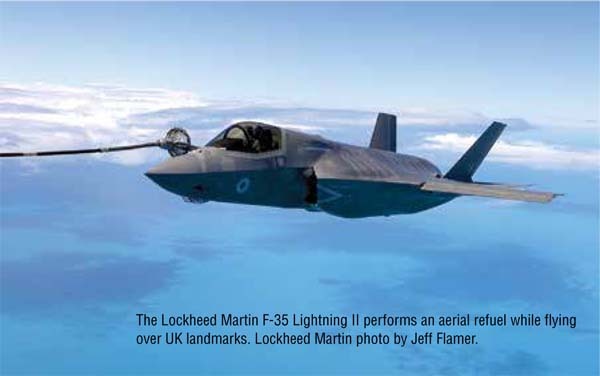 Lockheed Martin's F-35 fighter jet embodies a range of leading-edge innovations enabled and connected by the digital thread. 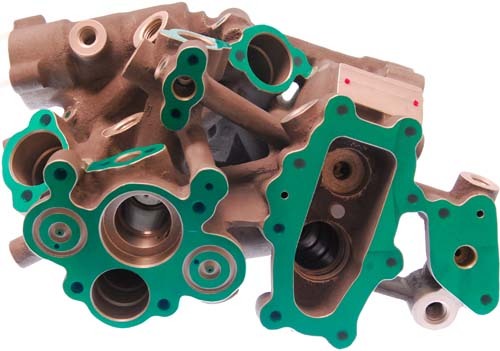 At the same time, industry-wide needs for special supplier processes and precision machining are fueling demand for collaborative engineering and people-driven skills that are critical to the quality of aerospace parts. After bringing home a doctorate in polymers from Texas A&M and working five years in plastics for an oil company, Don Kinard came to Lockheed Martin in 1984 as a composites engineer, hoping to "get off airplanes and not travel. Whether or not that wish came true may be partly a matter of semantics because Kinard has spent the majority of his career since then working on planes–specifically, Lockheed fighter jets. Since joining Lockheed Martin, Kinard has worked in R&D, engineering, and manufacturing, including an 18-year stint on the F-22 Raptor program. In 2004, he came over to the F-35 Joint Strike Fighter program as director of production engineering, a position in which he was responsible for Joint Strike Fighter tooling, planning, manufacturing engineering, and aircraft systems testing. "That's kind of where I got started," Kinard said in a phone interview. "Basically, my team set up the factory and did all the manufacturing planning and tooling for the current aircraft." Today, a little more than 33 years after starting at Lockheed, he has two roles with the company as a senior technical fellow for Lockheed Martin Aeronautics production operations in Fort Worth, Texas. "It's the best job you can have at Lockheed Martin, in my opinion, because it's a director level position where no one works for you, and I really like that," Kinard said. In one role, Kinard is lead engineer of the F-35 production system, managing the transition of production from one aircraft per month to 20 per month. "We're currently at five a month, going to about 13 or 14 a month in the next three to five years," Kinard told Design-2-Part Magazine. is other role, a corporate one, has him leading Lockheed Martin Corporation's Manufacturing Fellow's Action Team (FACT), which is dedicated to sharing manufacturing technologies and insights across the company's business units. 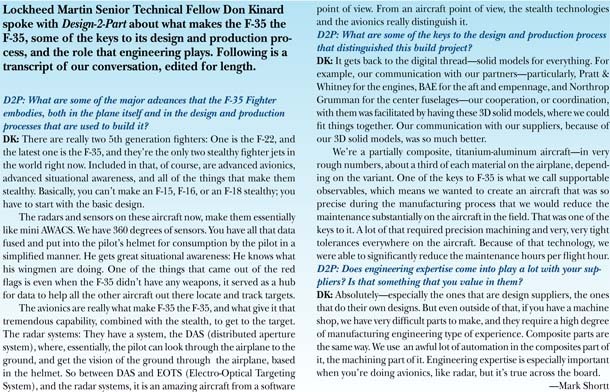 Kinard's background gives him a unique perspective on the design and manufacturing of the F-35 Lightning II Fighter Jet. He said that the key technology behind its development and production is the digital thread, a term that Lockheed coined several years ago and which has since gained momentum within the aerospace and defense industry. 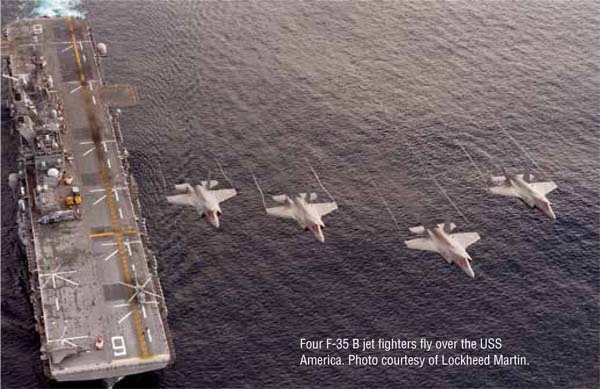 The digital thread enables Lockheed Martin's engineers to electronically exchange and process manufacturing information using standardized, three-dimensional (3-D) models, instead of using traditional 2D models, or blueprints. Engineers can guide a product through its life cycle much more quickly and efficiently via the digital thread, which extends from initial design all the way through final inspection of the part. "When I say digital thread, I mean that we have solid models for the engineering parts," Kinard explained. "We still have 2D drawings that we consume on the floor, but I do all of my integration using 3D models." Lockheed Martin gains several benefits, such as reducing the cost and time required to rework parts, by using the digital thread. The company's partners and suppliers load their solid models to a common database, enabling their engineers to see that "everything fits the way it's supposed to," he said. "When we didn't have digital thread, we had many more engineering changes because things didn't fit the way they should have," said Kinard. "Now, with the digital thread and the ability to do real time integration, everything fits together real well. We have a lot less interference between parts, as well as between parts and tools." Lockheed Martin Aeronautics also uses the digital thread to support and enhance the automation of manufacturing processes. Today, it drills about 80 percent of its external holes using automated drilling, and continues to seek further opportunities to automate its processes. The company further uses the digital thread to support robotic spraying of finishes and coatings, 3D printed tooling, and the delivery of 3D data, such as engineering graphics, into the hands of its mechanics on the shop floor. "We're experimenting with augmented reality and the ability to look at 3D models in glasses or on tablets," Kinard said. "We also do a lot of projection, where we can actually project work instructions onto the surface of the airplane, identifying what fasteners go in what holes, for example. That's a big thing, and there's a lot of opportunity to do that." Quality is another beneficiary because the digital thread can greatly aid in the inspection of aircraft parts, surfaces, and systems. Smaller parts and larger structures, such as wings and fuselages, can be measured using non-contact metrology instruments that employ laser scanning or structured light scanning. The key, Kinard said, is the ability to measure an as-built configuration and directly compare it to the 3D solid model. "That is an incredibly powerful tool. Today, we do it for troubleshooting and first articles, but, eventually, it will be so common that every airplane will be checked using that technology for real-time quality implementation." For the F-35, the digital thread also is a pathway that enables Lockheed to deliver to its pilots, via their helmets, all the information they may need while flying. And Kinard sees a parallel between what the digital thread provides for pilots and the opportunities that it presents for manufacturers in not just aerospace, but many other industries. "The F-35s are very special because we take enormous amounts of data and fuse it together for the pilot to consume in a simplified manner," said Kinard. "That, really, is the power of the F-35–that situational awareness that arises from the data fusion. And that same data fusion is now getting absorbed in manufacturing and sustainment, where, instead of having all these data sources, we consolidate the sources and are able to consume data more easily." An aircraft fuel pump, cast in A356 aluminum, that has been penetrant inspected, chromate conversion coated, masked, and ready for anodize. Photo courtesy of Magnetic Inspection Laboratory, Elk Grove Village, Illinois. Examples, he said, are dashboard data, automated metrics, and automated factory management systems. "Technology wise, it's really an explosion. A lot of people call it Industry 4.0, or the fourth industrial revolution. It's a revolution of data, data analytics, and data fusion, and it's pervading probably every industry in the United States." Developments such as these leave Kinard in awe of the impact that digital innovation has had on the aerospace industry. Technology is exploding, he said, at a time that he called "probably the most innovative time in the 30-plus years that I've worked in the business." "From an innovation point of view, there's just tremendous progress around the board," he said. "I used slide rules when I was in college, and probably 10 years ago, I thought, 'What else can happen here, technology wise?' But the rate of technology change and the rate of consumption and implementation of the technology have really accelerated, especially in the past 10 years, and even five years. So I would say it's probably the most innovative period that I've ever seen in aerospace." Kinard believes that as technologies like additive manufacturing, automation, and augmented reality continue to advance, they will play an essential role in helping aerospace manufacturers stay globally competitive. All of these technologies have connections to the digital thread. "Additive manufacturing still has quite a ways to go in terms of structural parts for the airplane, but it's already being used for tooling, and we've done thousands of tools with it. It'll be very useful in maintenance of the aircraft out in the field. That's a big technology. "I think automation will continue, but it's really hard to tell now about robotics and [how far robotics will go], especially when you start talking about factory friendly robots that work together with the mechanics. That's still a little bit far in the future. "Augmented reality, and remote AR in particular, is a big technology. When you think about that kind of thing in the future–being able to consume engineering instructions and communicate all over the world through glasses and voice commands–and the ability to do that in real time, it can have a significant impact on cost and schedule for maintaining the aircraft in the field." One aspect of Lockheed Martin's operations that isn't well appreciated, Kinard said, is the important contributions that its people make on a daily basis–what he called the "people part of the equation." He said that his workforce for building F-35s will double over the next three years, an increase that will include the hiring of several hundred engineers, aerospace mechanics, and support people. "The people part of this has been very important," said Kinard. "We built a brand new $10 million training center for these new mechanics because we've got to bring them in and make them F-35 mechanics. We're trying to do realistic training in a realistic environment that mimics the factory and its configurations. And all of that training starts and kind of really gets going next year. It's exciting to bring these people in. They're energetic, they're hungry, and this is a wonderful environment to bring them into." Smith & Richardson precision machined this part&nsash;an electronic component housing&nsash;for an aerospace application. Photo courtesy of Smith & Richardson, Inc., Geneva, Illinois. Although he was aware of potential problems in finding people with the required skills, Kinard said that Lockheed has had good success so far with the people they've interviewed. "We hear a lot about the lack of skills in the workforce today, and that was concerning to us, but one of the nice things is that we're starting to get applicants that used to work on F-35s in the military, and people who worked on helicopters. Our number one hire is ex-military folks who worked on helicopters, or some other mechanical work on aircraft because, frankly, those are people who already respect the equipment that we're building here. They're already used to very high tolerance, very process- critical types of operations on those jets in the field, and it's the same for the commercial industry, too–those guys from the commercial industries. "We thought it would be harder, but so far, so good. We still have about 1200 to find, so we've still got a ways to go, but it's looking good." As Lockheed Martin Aeronautics aims to ramp up its workforce for the F-35, the U.S. aerospace and defense industry is thriving amid strong demand for commercial aircraft and space systems, coupled with rising defense budgets. In 2016, the U.S. aerospace and defense industry generated $872 billion in sales and supported 2.4 million American jobs, according to the latest figures available from the Aerospace Industries Association (AIA). These totals represent marginal declines of 0.7 percent and 0.6 percent, respectively, from the previous year. At the same time, the industry produced a record $146 billion in exports, chalking up its largest-ever positive trade balance at $90.3 billion, the highest of any U.S. industry sector. And while government funding of research and development (R&D) relevant to the U.S. aerospace and defense industry rose 7.5 percent in 2016 to $84.7 billion, R&D spending by the 25 U.S. aerospace and defense companies that ranked highest in gross sales that year shot up 8.7 percent to $18.1 billion, AIA reported. "The commercial industry is exploding," said Kinard. "You look at the number of pilots they need, you look at the number of aircraft they're going to need over the next 10 to 20 years, and those numbers are huge." The commercial aircraft industry is in an unusually prolonged, extremely healthy "double cycle," said aerospace industry analyst Richard Aboulafia. "Normally, we have seven good years, three bad years. We're getting towards year 14 or 15. It's just an amazing cycle." One would need to look no further than the aerospace giants Boeing and Airbus to see the truth of Kinard's statement. Last September, Boeing announced that its total backlog for its 737 family of planes had reached 4,485. "Boeing makes 44 of those airplanes (737s) a month right now, and they can't make them fast enough," said Mike Noettl, special process engineer at Magnetic Inspection Laboratory, Inc. (MIL), Elk Grove Village, Illinois. "They're backlogged 5,000-plus aircraft, and Airbus is in the same boat with their A320 and their A350 models. The demand for aircraft far exceeds the ability of the supply chain to deliver product. There's just not enough manufacturing capacity to meet demand." 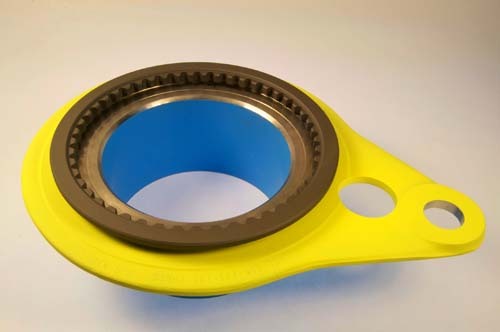 An ultra-precision machined titanium forging that is a helicopter part with multiple, selective performance coatings. It features an anti-galling blue coat (0.008 inch), dry film molybdenum disulfide (0.0005 inch) and epoxy polymide primer (0.0007 inch). Photo courtesy of Magnetic Inspection Laboratory. Richard Aboulafia, an aerospace industry analyst and vice president, analysis, at Teal Group Corporation, an industry research firm in Fairfax, Virginia, told D2P that the commercial aircraft industry is currently in an unusually prolonged, extremely healthy cycle. He called it a "double cycle." "Normally, we have seven good years, three bad years," said Aboulafia. "We're getting towards year 14 or 15. It's just an amazing cycle. Defense budgets are quite robust, too, which helps the military aerospace side of things. There are very few weak area–s a couple of soft spots, but in general, we see growth through the end of the decade." "Boeing makes 44 of those airplanes (737s) a month right now, and they can't make them fast enough," said Mike Noettl, special process engineer at Magnetic Inspection Laboratory, Inc. (MIL), Elk Grove Village, Illinois. "They're backlogged 5,000-plus aircraft, and Airbus is in the same boat with their A320 and their A350 models." Aboulafia identified a number of factors that he said are likely to continue to drive the industry's growth. One is the combination of strong aircraft passenger demand–people want to fly–and rising demand for military equipment and weapons–"stuff that explodes," he said. Another is strong demand from emerging markets, especially China, where companies have yet to master the unusually high barriers to entry that surround the commercial aircraft manufacturing industry. "China is a long way from standing up its own commercial aerospace capability," he said. "So right now, they're the biggest single export market in the world." Magnetic Inspection Laboratory, Inc. (MIL), a company that provides special process services like anodizing and cadmium plating to aerospace prime contractors, has been an approved supplier to Lockheed Martin for more than three decades. The company began in 1942 as a one-man operation that examined parts for the U.S. Government. Today, Magnetic Inspection Laboratory provides five broad categories of services, including chemical processing (CP), coatings (CTG), nondestructive testing (NDT), shot peening, and welding and brazing, at its 120,000-square-foot facility in Elk Grove Village, Illinois, about a 15-minute drive from Chicago O'Hare International Airport. Mike Noettl, a special process engineer at Magnetic Inspection Laboratory (MIL), said that the company's special processes are a vital link in the aerospace manufacturing supply chain. "Whether they're for helicopters, airplanes, missiles, or spacecraft, the types of processes that we perform here are used in every one of those markets," Noettl said in a phone interview. "It's at the absolute tail end of the entire manufacturing process, and it's really the validation. We're working on individual pieces; we're not working on an entire wheel assembly, or an engine. We're inspecting, testing, finishing, and improving the individual parts before they're assembled into a higher assembly." Noettl said that its people, combined with 76 years of aerospace experience, are by far the company's greatest strengths. That's important because the special processes that the company uses require a high degree of skill on the part of human operators. Hoster contrasted the equipment used by Magnetic Inspection Laboratory's technicians with machinery such as a boring machine or a horizontal milling machine. "It's a spray gun in the hands of a technician that can hold tolerances, by hand, that are a hundred (100) times thinner than a human hair," he said. And these are targets that we just have to hit. These special processes are really humanly driven, and, obviously, there's some variation and fluctuation in what we do, but you still have to control them within certain aerospace specification requirements. And so it's really a unique industry. If it was easy, I'd have competition next door, or down the street, but the fact of the matter is that our nearest competition is in Wichita [a good distance from Chicago]. People from custom machine shops and the aerospace primes walk into our facility, and their jaws hit the floor. They go 'How do you guys do this stuff?'" The special processes that MIL provides to it aerospace customers rely heavily on the experience and knowledge–both tacit and explicit–of its engineers and technicians. With this in mind, MIL maintains a strong base of veteran process personnel while focusing on knowledge sharing and management within its organization. That bench strength enables MIL Inc. to be agile in responding to customers' needs by quickly adding new processes and capital equipment to its plant. Last year, the company invested about $3 million last year to upgrade its equipment and infrastructure. Besides adding a pair of 6-axis robotic shot peening systems, MIL brought in an overhead conveyor paint line with proprietary cure capabilities. It also added 25,000 square feet of space to accommodate growth in its nondestructive testing (NDT) and welding and brazing segments. "Our constant addition of special process capabilities enables MIL Inc. to quickly expand and service multiple product and market sectors," Noettl wrote in an emailed response. Examples of the aircraft components and systems that MIL is able to service are engine components, landing gear systems, ancillary support systems (such as oxygen delivery systems, auxiliary power units, and avionics), airframe components, and components for rotary winged aircraft/helicopters. The company can also process parts used in electronic intelligence gathering equipment and missile defense systems, he said. "If you can buy a million dollar milling machine and bolt it to the ground, you're turning parts in weeks," said Noettl. "But that doesn't happen with special processes because these processes hinge upon, and are driven by, experience and the human element. It's a spray gun in the hands of a technician that can hold tolerances, by hand, that are a hundred (100) times thinner than a human hair." In one example, Magnetic Inspection Laboratory received a job from a prime contractor that required it to anodize, prime, and paint a high volume of aircraft wheels per day. The company had to design and construct a coatings line specifically for the application of wet prime and paint on aircraft wheels that ranged from the iconic B-52 Stratofortress to business jets, Noettl said. Over the years, Magnetic Inspection Laboratory had processed small quantities of aircraft wheels, but this job was different. The sheer volume and cycle time were well beyond its current capacity and capability. Cure time for the coatings accounted for nearly 60 percent of total production time, and the specification allowed no wiggle room. "We had to employ an exhaustive amount of engineering and testing in developing a solution," Noettl said. "We were tenacious in our efforts and relied heavily on production and manufacturing input to tweak the processes." Noettl said that it's always a challenge to identify materials having the required conformability characteristics, chemical resistance, and high heat tolerance, as well as abrasion resistance and removability, all wrapped up into one solution. But an even bigger engineering challenge was the wide variety of sizes, weights, and masking variation. Noettl said that Magnetic Inspection Laboratory drew heavily on technology resources, breaking the standard tried, true, and tested methods that had served them well in the past. "We established new benchmarks and methodologies that will serve us well on future projects," he said. Because aircraft parts and assemblies typically require several different special processes, many of them log frequent flyer miles traveling between multiple suppliers before being installed on an aircraft. For customers, this adds shipping time and cost, plus the likelihood of finger pointing if anything goes wrong. Magnetic Inspection Laboratory's ability to perform multiple and diverse processes in a single location relieves customers of these concerns. Magnetic Inspection Laboratory (www.milinc.com) used several manufacturing processes on the project, including nondestructive testing, masking, anodizing, and shot peening. The company also provided priming and painting, part marking, and custom packaging. "By adding a couple of key special processes to our arsenal, we significantly decreased the number of supply chain stops," Noettl said. Smith & and Richardson, Inc., a contract manufacturer headquartered in Geneva, Illinois, uses high precision CNC machining operations–including Swiss machining, turning, milling, and electrical discharge machining (EDM)–to produce parts for the aerospace industry. Some of the components that the company makes eventually become parts of valves and sensors to aid in flight control. Others end up on Boeing planes and the Space X rocket, according to Rich Hoster, president of Smith &Richardson. Hoster said that the most critical capability that its aerospace customers demand is the ability to achieve part quality requirements. The company, which employs 54 team members at its 70,000-square-foot facility, recently achieved recertification of its quality management system to ISO 9000:2015, the latest quality standard. "Quality is a given, but in the aerospace industry, it is something that everybody takes extremely seriously," said Hoster in a phone interview. "We are producing parts to very, very strict tolerances–edges that can't have even the slightest defect on a machined edge. We also machine a lot of difficult-to- machine materials that a lot of people don't like to touch and machine. Those are kind of the areas that we've heard from our customer base that they feel we do a good job and that's one of the reasons they continue to work with us." One niche that serves the company well in the aerospace industry is the machining of parts for retrofit or replacement purposes. "They're not huge volumes; they're small to mid-size volumes," Hoster told Design-2-Part Magazine. "And a lot of people don't seem to like to do small volume production, or those that want to do them don't have the quality systems, the depth of organization that we have. That's another area that we have been told that we excel in." One of the Smith & Richardson's biggest strengths, Hoster said, is working closely with its customers to ensure their products can be cost effectively manufactured. 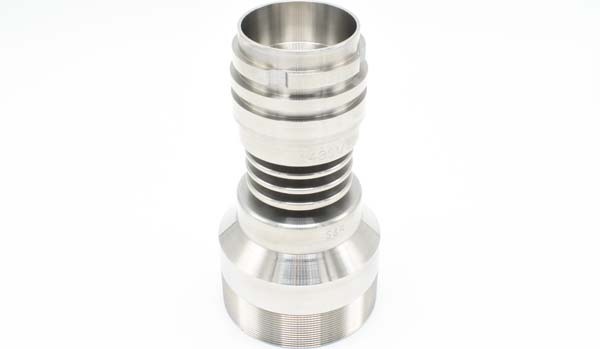 To help customers achieve the most cost-effective production methods for their precision machined parts, the company uses a collaborative approach among its manufacturing engineering group, quality engineering group, in-house tooling staff, and its customers. Hoster emphasized the importance of "talking processes through to make sure everybody's on the same page" and ensure that the customer is getting what the customer wants. "When you start getting into difficult-to-machine materials, we spend a lot of time talking with Sandvik engineers or Kennametal engineers, discussing the types of material that we want to machine and the type of machining process that we intend to use with that material," he said. "We get their input on what types of coatings, what types of tools they feel would work best to allow us to meet the cycle times that we say we're going to meet in order to produce the part at the cost we're going to produce it." Smith & and Richardson (www.smithandrichardson.com) strives to continually increase its capacity by adding new CNC and inspection equipment to its operations. In 2017, the company brought in two new Citizen Swiss L20 Type XII machines and one new Eurotech machine. "We typically invest between $500,000 and $1 million on new equipment annually," Hoster said.